Komola (or Komla for short) is the Bengali word for orange, either the fruit or the color. And Komolabhog is the Bengali sweet with the flavor and the color of an orange. It’s made with chhana and orange extract, and it is a variation of the more famous Bengali sweet, the Roshogolla. This is a traditional recipe we used to make Komolabhog. First knead the chhana with Sooji and a little bit of sugar to make a smooth dough. Then form around 1 inch diameter balls of the dough. And finally boil the balls of chhana in the boiling syrup to make Komolabhog. 2. Add 1 level tea spoon sugar. 3. 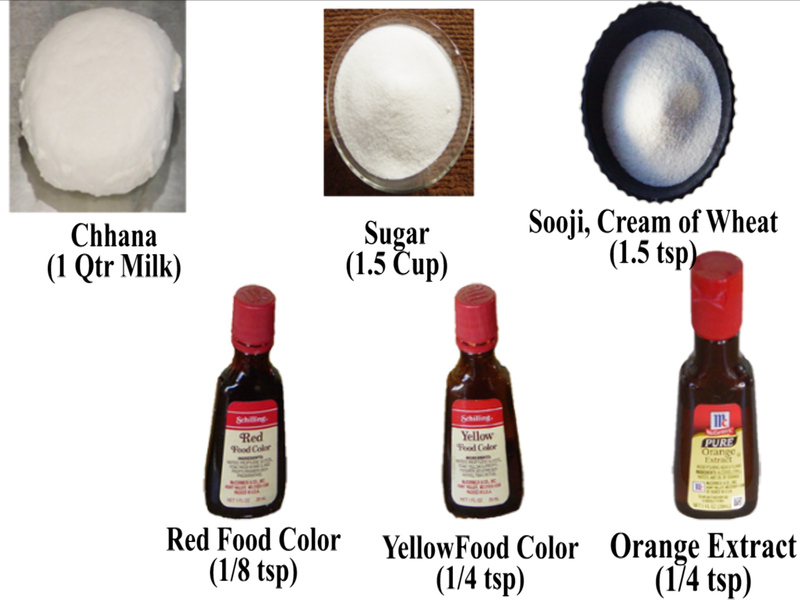 Add 1 & 1/2 level teaspoon Sooji . Be careful not to exceed this amount or else the komolabhod may become tough and chewey. 4. Add 1/8 teaspoon Red food color. 5. Add 1/4 teaspoon Yellow food color. 6. Add 1/4 teaspoon orange extract. 8. Knead it until the color is uniformly orange. 9. Rub the mixture with the palm of the hand to make smooth dough. 10. You may want to knead the entire thing one more time. 11. Roll into a dough into one long piece. 12 Then divide it to 8 equal parts. 13. Roll each into a round ball. 14. Repeat this process with all the dough to make 8 of these balls. 15. Cover them with a wet cloth. 17. Add 1 & 1/2 cup sugar into a pan. 19. Turn on the heat. 20. Stir the sugar till it dissolves. 21. Continue heating till the syrup starts boiling. 22. to the syrup, add the chhana balls. 23. Cover the pan but keep eye on it because the syrup might overflow. 24. The balls will puff up as it is boiled. 25. Flip them over occasionally. 26. Heat for 30 minutes. 27. The syrup level should be just high enough that the Komolabhogs do not touch the bottom of the pan. If the syrup level is too high, then boil the syrup separately to concentrate it. 28. Turn off the stove. 29. Allow everything to cool. 30. Leave them overnight for the sugar to permeate the chhana. This completes the Komolabhog preparation. And serves 2 – 4 people. Serve the Komolabhog chilled or at room temperature.